Every star has a story. Some are as old as time, faint and almost forgotten. Others burn bright and end their lives in powerful explosions. New stars are created every day, born of vast clouds of gas and dust. Through every phase of their existence, stars release the energy that powers the Universe. Journey to the farthest reaches of our galaxy and experience both the awesome beauty and destructive power of STARS. 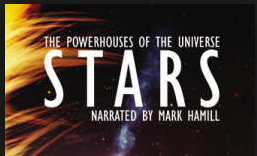 Narrated by actor Mark Hamill. Appropriate for children 8 yrs and older.